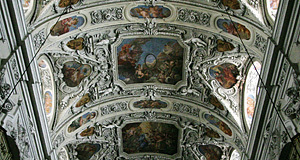 Baroque art and architecture is an Italian invention - mostly originating from Rome. North of the Alps, it was first introduced to the principality of Salzburg in the early 17th century. At this time, Vienna was a city in the middle of a swamp, at constant danger of being sacked by Turks, Protestants or more Turks. Needless to say, the splendour of Baroque art and architecture bloomed in Vienna much later than in Salzburg, about a century later, to be precise. Therefore, Vienna has very few examples of early Baroque art. One noteworthy exception to this rule is the Dominikanerkirche or Dominican Church in the first district, the historic Vienna. The first Dominican Church was built in 1237. The order of the Dominican monks had been called into Vienna by the Babenberg Duke Leopold VI. They had been given a piece of land near one of the gates in Vienna′s city walls, the Stubentor Gate. Here they had built a monastery and the church. Unfortunately, the Romanesque building burnt down twice, and in 1283, the monks decided to demolish the remaining foundations. On the site of the church, a new one was built, this time in Gothic style. Its choir stalls were "opened" and blessed by the Dominican and cardinal Nikolaus Boccasini, who later became Pope Benedict XI. During the first Turkish siege of Vienna in 1529, most of the Gothic Dominican church was demolished to get stones for supporting and fixing the city walls. In 1631, the battered church was finally due to be re-built properly. The fairly newly developed Italian Baroque was chosen as the style of the day and Emperor Ferdinand II himself gave order to start the construction. Many Italian craftsmen and artists worked on the site and created a truly impressive building. Being from Salzburg myself and a big fan of Italy, I have always liked the Dominikanerkirche a lot. Only three years after the beginning of the consturction, in 1634, the new Dominican Church of Vienna was opened. This applied to the basic walls and much of the interior, but not the dome and the façade. Ornaments and a cupola were added until 1674. Until the construction of the Karlskirche, the Dominikanerkirche was Vienna′s second largest church (after the Stephansdom Cathedral, obviously). The main nave of the church is 46.5 metres long, some 21 metres wide and 22 metres high. More recent additions include the altar paintings by Karl Rösner and Leopold Kupelwieser from 1840 and the organ, which dates back to 1896. In 1927, the Dominikanerkirche was made a "Basilica minor" by Pope Pius XI. Attractions nearby include the old university district and the Jesuite Church, the Museum of Applied Art, the Heiligenkreuzerhof and the Postsparkasse. Many other attractions are within walking distance - keep in mind that the Dominikanerkirche is in a very central location of Vienna.